In 2005 I had the privilege of scoring, performing, and recording music for Anne Tubiolo’s beautiful documentary movie, LAND OF STONE AND LIGHT. Ms. Anne’s film is presented daily at The Badlands National Park Visitor Center – this is the instrumental soundtrack. Because some park visitors expressed interest in the music after viewing the film, the National Park people requested a recording of the tunes that accompany the program to sell in their bookstore. Since the length of the film is approximately 20 minutes, I expanded several of these cuts to make the total running time around 40 minutes. 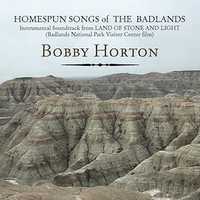 When scoring for a historical film I normally look for popular, period- correct melodies to play – because this is a film about the wildlife and natural beauty that is found in The Badlands National Park, I wrote the music to eleven of these cuts on the album. The others were written by songwriters in the 18th and 19th century: Stephen Foster, Robert Burns, Muzio Clementi (c. 1750) and also a traditional Lakota Sioux melody. Like all my previous recordings, I did all the arrangements, performances, and recorded this music in my home production studio – hence the "Homespun..." in the title. I had a lot of fun revisiting this soundtrack of 2005 – I do hope you will enjoy these tunes as well!